black & white illustrations 336 Across Great Divides, true stories of life at Sydney Cove will appeal to all readers, young, old and in-between, who love to be immersed in a good read, while learning new things. The stories will no doubt make you wonder, what would I have done? 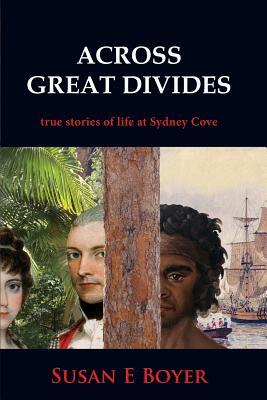 Across Great Divides, true stories of life at Sydney Cove, brings to life the diverse experiences of people living in the precarious circumstance of Australia's first penal colony. The stories are relayed through a non-fiction narrative which shows how convict men saw and seized the possibilities of their new position. It portrays the situation of convict women and their relationships with military men. The stories demonstrate the varied responses of participants to their unique situation: some succeeded beyond their imagination, some failed disastrously. The stories also give voice to the dilemma of the Aboriginal people challenged by the unexpected arrival of a completely alien race of white people to their land: Bennelong and his difficult to ignore wife, Barangaroo, dealt with their new circumstances in a way they felt would best benefit themselves and their people.